The Golden Gate Bridge’s iconic “International Orange” paint job was a bit of a happy accident. If the United States Navy got its way, the landmark stretch of infrastructure would look like a bumble bee. That would’ve been just sad. The black-and-yellow stripe color scheme, of course, was a design that emphasized practicality and visibility. Since it’s built out of a steel alloy, the Golden Gate Bridge needed a sturdy paint job in order to protect it from rust and corrosion. The salty air and characteristic San Francisco fog made these problems worse. The fog, in particular, raised the visibility concern. The last thing anyone wanted was for a tall ship to crash into the $35 million bridge, taking out cars and pedestrians in the process. So, during construction in the 1930s, the War Department got invovled. The military initially objected to the bridge altogether for fear that Navy ships would get stuck in the Bay if the bridge collapsed, due to tall ship or bombers or otherwise. Once it had been dissuaded, the Navy proposed the bumble bee design. This was just a few years after the dawn of “dazzle” camouflage, an avant-garde design practice intended to hide things—even massive ships—in plain sight. The Army Air Corp also favored the dazzle-inspired approach and proposed a red-and-white stripe color scheme. 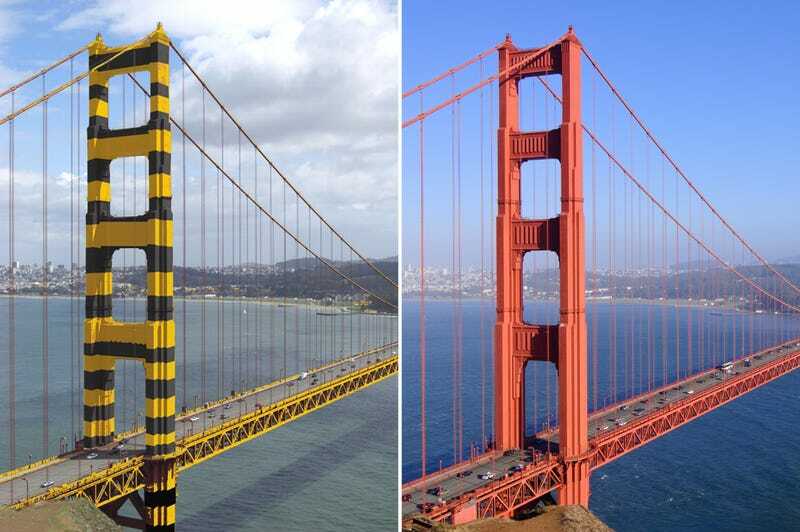 In conclusion, the military either wanted the Golden Gate Bridge to look like a bumble bee or a candy cane. Thankfully this didn’t happen. When the steel beams arrived to the bridge construction site, they’d already been painted with an international orange-colored primer. The original plan was to paint over the primer with a black or grey or (God forbid) military-order dazzle design. Consulting architect Irving Morrow actually wrote a lengthy “Report on Color and Lighting” that analyzed every aspect of the bridge’s appearance. Ultimately, Morrow decided that the international orange looked pretty damn good. The reddish hue provided a pleasing contrast between the bright blue California sky as well as the golden hills on either shore. Most importantly, the color was bright enough to stand out in the fog. The zinc protects the steel, because zinc corrodes more easily than steel. Zinc serves as a sacrificial metal, so the steel does not rust when zinc is present. On top of that zinc primer is a top coat of paint in the Golden Gate Bridge’s signature color called International Orange. The formula for international orange is no secret. The specific CMYK formula and color codes are published on the bridge’s website. You can also buy a close approximation off-the-shelf from Sherwin Williams. It’s called “Fireweed”—a name that’s frankly a little more fun than international orange. It’s certainly better than “Bumble Bee” ever would’ve been.